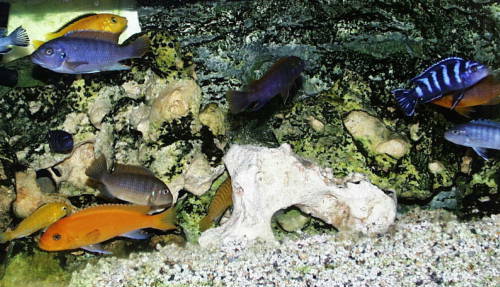 Surely one of the most colourful of freshwater setups, this setup was a rocky tank setup for the rock-dwelling cichlids (mbuna) of Lake Malawi in East Africa. This is another type of setup where I did a few slightly different versions over the years. The tank was set up with a rocky decor to provide plenty of caves, in order to mimic to some extent the natural environment of mbuna, where there are no higher plants (just algae on the rocks). Ocean rock or "Holey limestone" was the main rock used in the setup pictured above, though in other previous Malawi setups I have also used slate, limestone and a local rock called Millstone Grit. The substrate shown above is crushed Alfagrog, a ceramic filter material based on calcium carbonate. As it is considered normal to overstock these particular cichlids to control aggression, the tank needed to be well filtered. Strong circulation and aeration was provided by two powerheads with Hagen QuickFilter cartridges to provide excellent mechanical filtration, and some back-up biofiltration via the media placed in the core of the cartridges. The main biofiltration was provided by an external canister filter with a spray-bar return. To cope with the wastes from a well-stocked tank, approx 35% water changes were performed on a weekly basis, this kept the pH stable and nitrates under control. Captured in the above picture are the ever-popular Yellow Lab (Labidochromis caeruleus), Rusty Cichlid Iodotropeus sprengeri, Pseudotropheus demasoni, Pseudotropheus socolofi and Metriaclima estherae (orange female).